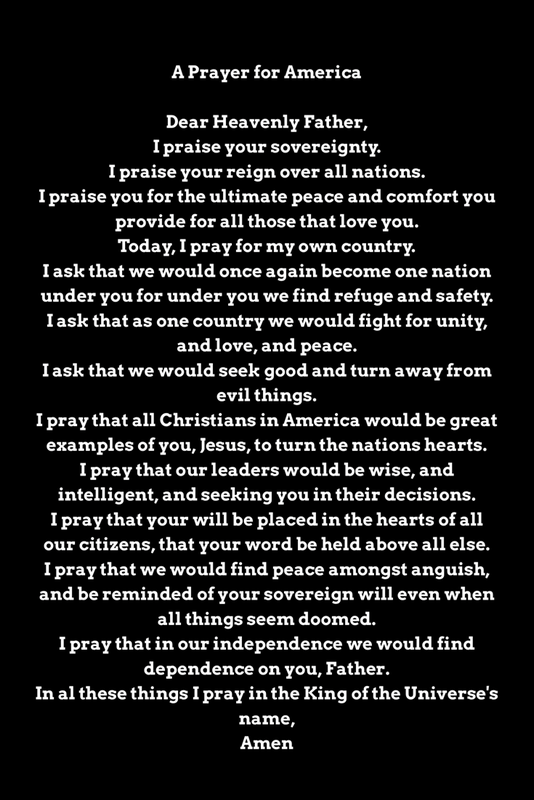 Pray for our country this Independence Day. I praise your reign over all nations. I praise you for the ultimate peace and comfort you provide for all those that love you. Today, I pray for my own country. I ask that we would once again become one nation under you for under you we find refuge and safety. I ask that as one country we would fight for unity, and love, and peace. I ask that we would seek good and turn away from evil things. I pray that all Christians in America would be great examples of you, Jesus, to turn the nations hearts. I pray that our leaders would be wise, and intelligent, and seeking you in their decisions. I pray that your will be placed in the hearts of all our citizens, that your word be held above all else. I pray that we would find peace amongst anguish, and be reminded of your sovereign will even when all things seem doomed. I pray that in our independence we would find dependence on you, Father.